Rated R for bloody horror violence, and language throughout. With “Abattoir,” director Darren Lynn Bousman takes a clever idea and a relatively talented cast and cobbles together one of the most baffling and ineffective horror films of the year. The dialogue isn’t just awkward and unbelievable—it’s as if it was written by a teenager raised on only bad horror movies. The pacing isn’t just clunky, it’s edited in a way that almost feels designed to be distracting. The performances are uniformly bad, even from actors who normally do good work. It’s one of those movies that's so inept on every level you almost want to recommend it. If you operate under the belief that you can learn as much, maybe even more, from bad movies as you can from good ones, this one is a master class in what not to do. Perhaps the pain of “Abattoir” is magnified by the decent concept that is buried by the incompetent filmmaking. Jessica Lowndes plays Julia Talben, a real estate reporter whose family is brutally murdered by a sociopath. When she returns to the crime scene after the funeral with her cop friend Declan (Joe Anderson), she finds the room in which her loved ones were slaughtered has literally been ripped from the rest of the home. The two investigate further and the quest takes them into Julia’s past, including the town in which she was born, where, shall we say, things aren’t exactly normal. And a mysterious figure named Jebediah Crone (Dayton Callie) is building a home made entirely of rooms in which horror has ensued. If one unexpected death in a home creates a haunting, imagine what dozens would do. 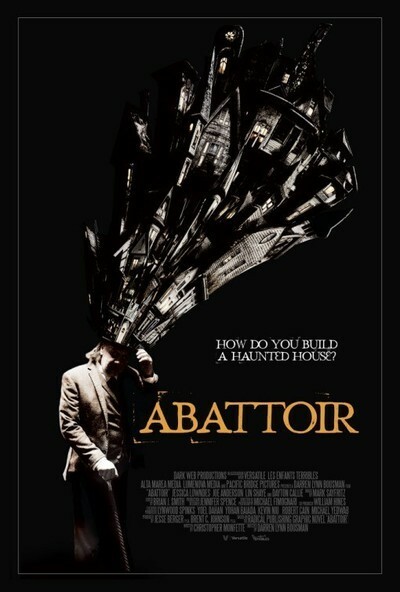 “Abattoir” is one of those films that’s 90% exposition, which shouldn’t be too much of a surprise coming from the man who directed three lesser “Saw” sequels, but it’s still so depressing to watch a movie that needs character and atmosphere but offers only plot. Julia and Declan have to investigate the murder, then the room disappearance, then her past, then Jebediah, and so on and so on. It’s little more than a series of exchanges about what they have just discovered, culminating in a sequence designed to be terrifying but is really more comforting because you know the movie is almost over. We’ve reached the point in a review where one could go on and on about the inadequacies of this film, including its jarring tonal shifts, clichéd dialogue, etc. But perhaps it’s easier to keep it short but bitter and leave it at this: perhaps it’s untrue that something can be learned from every movie, even the bad ones. Perhaps some movies are so bad they only teach us that life is too short to waste on them.